An Evening at Jal Mahal – Oh, I see! Yesterday, I decided to take a break and visited the Jal Mahal near Amer. I wasn’t expecting as many people and went with my sketching kit. I was wrong- the place had a lot of visitors and that was quite a nice thing because it looked so colourful and lively. Of course, that made sketching slightly tricky. In Jaipur, it’s almost an unsaid rule- Where there’s crowd, there are street food vendors. I saw people selling jumbo rice papads, wooden block printing stamps, key chains, decorative stationery and other things of the sort. The Jal Mahal (Jal= Water, Mahal= Palace) looked beautiful in the water surrounded by bright pink bougainvillea and a sort of bird (I think it was a crane) that looked too white against the brown and pink and green of the surroundings. 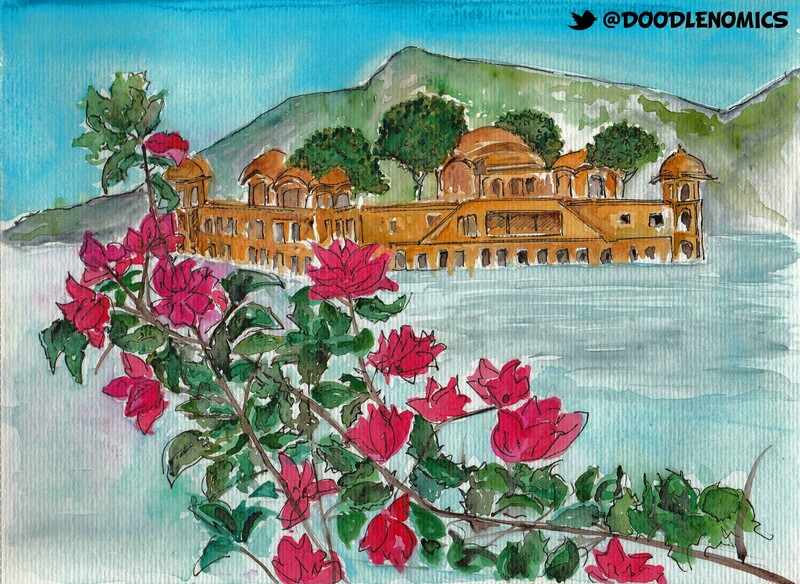 This was a quick sketch and I selected a view with the bougainvillea underlining the Jal Mahal building. I will be making another trip soon and probably sketch the people there. While this sketch was done in around 20 minutes, I enjoyed a quick snack afterwards. A chaat vendor screamed, “Berry berry tasty” and I knew I had to try the ‘very, very tasty’ sev puri he was selling.